The Lari comprise the Dromadidae (crab plover), Stercorariidae (skuas), Alcidae (auks), Laridae (gulls), Sternidae (terns), Rynchopidae (skimmers), and Glareolidae (pratincoles and coursers). With the exception of some Glareolidae, all of these birds live in aquatic environments. The Turnicidae (buttonquails) are the sister taxon of the above-mentioned taxa (Paton et al. 2003; Paton and Baker 2006; Fain and Houde 2007). The earliest fossil Alcidae come from North American deposits, which may indicate that the early evolution of these birds was restricted to the northern Pacific, where most extant species of auks occur (Olson 1985). Hydrotherikornis oregonus Miller, 1931 from the late Eocene of Oregon is based on a distal tibiotarsus. 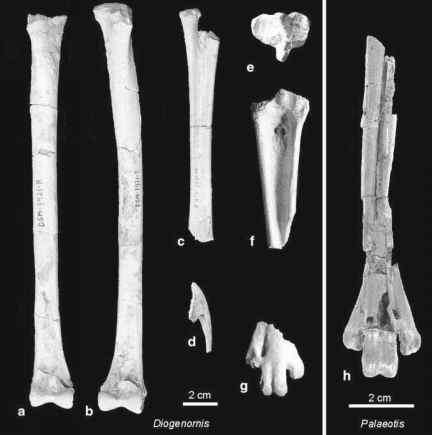 This specimen was assumed to possibly be from a procellariiform bird by Warheit (2002), but Chandler and Parmley (2003) reported a distal end of an alcid humerus from the late Eocene of Georgia, which further substantiates the presence of auks in the late Eocene of North America. There is no unambiguous Paleogene fossil record of auks outside North America. A partial skeleton from late Oligocene (MP 30; Mlikovsky 2002) marine deposits of Austria was described as Petralca austriaca by Mlikovsky and Kovar (1987), who assigned it to the Alcidae, within a new subtaxon Petralcinae. The authors did not detail the reasons for their identification of the fossil, and on the basis of the published photographs I consider it more likely that it constitutes a representative of the Gaviiformes. The distal humerus does not exhibit the characteristic derived morphology found in extant Alcidae, and in all characters listed by Mlikovsky and Kovar (1987) in which Petralca differs from the Alcidae (shape of proximal humerus and coracoid), it matches gaviiform birds, with which it was not compared (see also Warheit 2002). The carpometacarpus is, however, proportionally longer than in the Paleogene loon Colymboides. The Laridae and Sternidae are unknown from pre-Oligocene deposits, and all Paleogene fossils are from sediments of lacustrine origin. Kurochkin (1976, p. 78) mentioned an as yet undescribed "fragment of skull belonging to a large representative of the suborder Lari" from the early Oligocene of Mongolia, which "has no exact parallels among the recent families of that group." "Larus" elegans Milne-Edwards, 1868 and "L." totanoides Milne-Edwards, 1868 occur in late Oligocene lacustrine deposits of France (Hugueney et al. 2003; Mourer-Chauvire et al. 2004). Both species have an abundant fossil record in early Miocene French fossil sites of lacustrine origin and are very small, the size of small terns, with fairly long legs. They were classified into the new taxon Laricola by Mlikovsky (2002), but the exact phylogenetic affinities of these birds with respect to extant Laridae and Sternidae still need to be determined. On the basis of several postcranial elements, Mayr and Smith (2001) described two charadriiform species from the early Oligocene of Belgium as Boutersemia belgica and B. parvula, and tentatively assigned them to the Glareolidae. The coracoid exhibits a foramen for the supracoracoideus nerve, and the presence of a distinct tarsometatarsal fossa for the first metatarsal indicates that a hallux was present. Boutersemia shares with extant Glareolidae, Charadriidae, and Jacanidae a large distal vascular foramen of the tarsometatarsus; this presumably derived feature is absent in other extant charadriiform taxa. Compared with extant Glareolidae, Boutersemia most closely resembles the taxa Stiltia and Glareola (Glareolinae), whereas in Rhinoptilus and Cursorius (Cursoriinae) the hallux is reduced and the distal vascular foramen smaller; Cursorius further lacks a foramen for the suprac-oracoideus nerve. Stem group representatives of the Turnicidae were reported from the early Oligocene of France and Germany. These fossils belong to the taxon Turnipax and the tentatively referred Cerestenia pulchrapenna Mayr, 2000. Turnipax dissipata Mayr, 2000 was described from the Luberon in France. A second, slightly larger species, T. oechslerorum Mayr and Knopf, 2007, occurred in the early Oligocene of Wiesloch-Frauenweiler in Germany. Turnipax can be assigned to the stem group of the Turnicidae because of the unique, derived morphology of the coracoid, which agrees with the morphology of extant buttonquails in the presence of an unusually broad procoracoid process that almost meets the articulation facet for the furcula, and a markedly excavated impression for the sternocoracoideus muscle on the sternal extremity. The skeleton of Turnipax combines derived characteristics of crown group Turnicidae with a plesiomorphic and more typically charadriiform overall morphology (Mayr 2000c; Mayr and Knopf 2007a). Crown group Turnicidae are omnivorous birds, which take seeds and other plant matter as well as various invertebrates. The presence of gastroliths in the holotype of Turnipax oechslerorum indicates an at least facultatively granivorous diet of this species (Mayr and Knopf 2007a). C. pulchrapenna and extant Turnicidae lack a hallux. Its presence in Turnipax suggests that the habitat and way of living of this fossil taxon differed from that of crown group Turnicidae, which mainly inhabit open grasslands and arid scrub, and probably did not diversify before the spread of open habitats toward the Neogene (Mayr and Knopf 2007a).